Hi Cindy! Count me in. Thanks so much for the cute, fun giveaway. Did it - thought I already had! Hi Cindy! What a great time of the year to have a giveaway! An extra special Christmas present! Thanks for the opportunity. I have been a follower for a while now and so enjoy it! I want to wish you Christmas blessings and the joy of His love in your heart. You are so sweet to do these giveaways. The towel is just adorable and who would not love that cute snowman. Have a great new week ahead. I stopped by to catch up with you and I found your give-away. What a sweet surprise. Yes, I'm a follower! I'll be back again soon to see what you have to share. 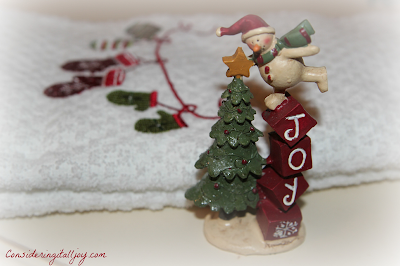 Hi Cindy, you are so sweet in your giveaway of such darling items. Thank you for the opportunity. You know I am a long time follower. Whoever is the winner will enjoy these sweet gifts. They certainly put one into a joyous mood. Oh, how sweet you are, Cindy! 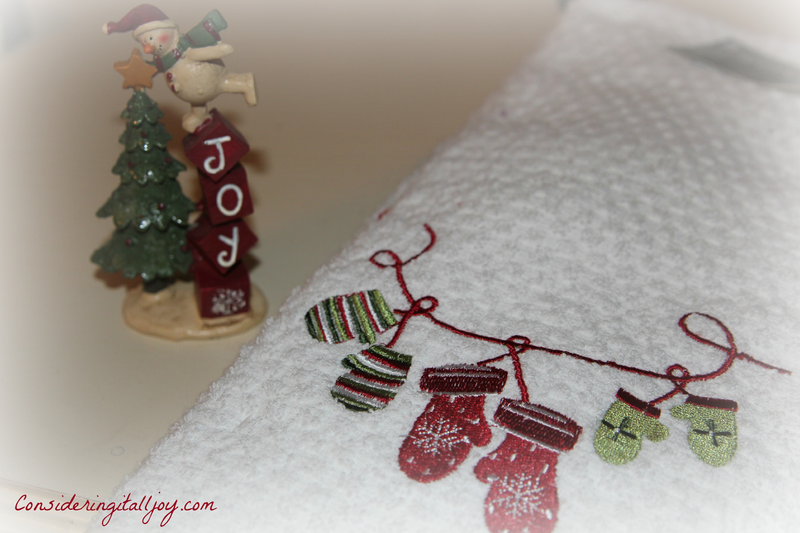 The dishtowel and the "joyful" snowman are so cute. You know I'm a follower! Hi Cindy....Your give away is a sweet one for the Christmas season. How thoughtful of you. I've been a follower for quite some time. How are things going at your house? Of course, I am already a follower.. What a sweet giveaway.. Count me in! Blessings! Sweet Cindy, what a lovely giveaway and I know someone will be richly blessed by your kindness and generosity :) Please count me out as I will be receiving a pocket letter from you very soon and that is a gift in itself. Hi sweet friend, I missed this the other name but I'm a follower, so please enter my name. I follow. Love all your nativities. A beautiful way to celebrate. I'm a follower and have been enjoying your photos this month. Thank you so much for sharing your love this season and all year. How did I miss this post? I know I read it, but I was in a hurry, probably read it on my phone which I don't usually respond with. I don't like texting. I can type faster.